Marianne Grasl, Rolf Nagel and Leo Grasl (18) host Somali refugee Leyla Mahamud and her baby boy Zacharia who was born April 29, 2016, a few weeks after she moved in, in Vienna, Austria. 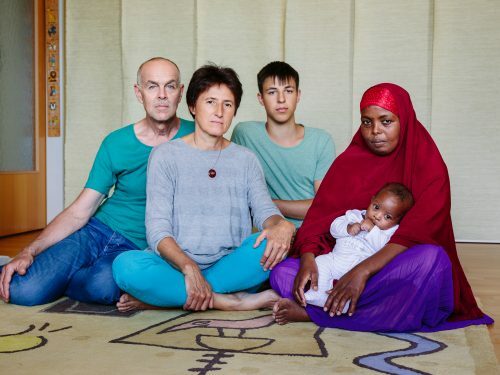 Marianne, a primary school teacher, wanted to offer her empty room to a refugee but she wasn’t sure she could handle living with a newborn baby. Marianne’s partner, Rolf, is an electrical engineer who volunteers by teaching German language classes to refugees a couple of times a week. “I supported Marianne from the beginning with this decision. Take in a refugee into your home to verify if it’s true or not what is written in the media. I want to have direct contact with them and see and discover their world. I want to find out how they are on my own. I believe that why they came here, whatever they fled from, must have been really bad,” said Rolf. Laila left Mogadishu in 2009 after she got entangled in a complicated web of honour killings. When she refused to marry a man her family arranged for her, she ran away and married someone else. Her family killed her new husband and then his family sought to kill her in revenge. They kidnapped her daughter and locked Laila up, but she escaped and fled to Saudi Arabia, then Turkey, then Vienna in March 2015. ” I was so scared when I first came here,” Laila says, “but they are so good to me.” She is trying to learn the language so she can start working.